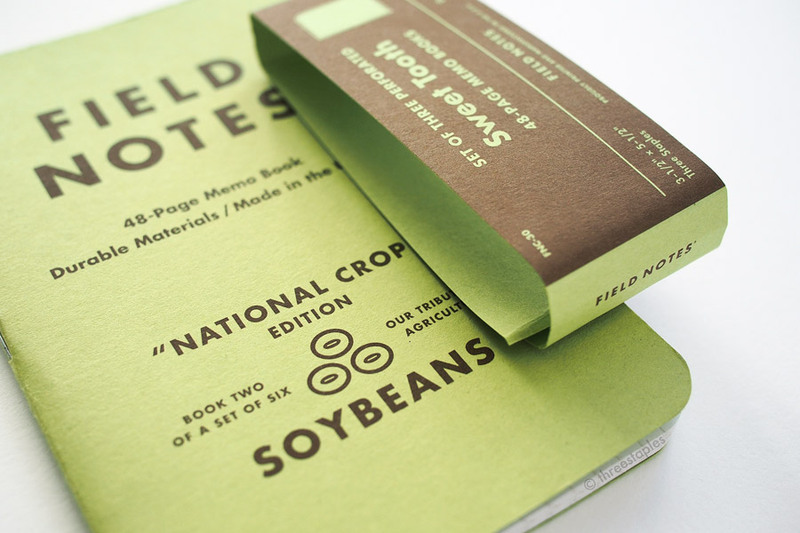 Sweet Tooth is the 30th edition of Field Notes COLORS, released in early March as the spring 2016 edition. Before its release, subscribers to COLORS were teased with a photo of a sheet of USPS stamps circa 1982, illustrated with state flowers and birds, and I immediately came up with rather straight-forward guesses. That the spring edition would be scented, philately-related, or that it’d be about state birds and flowers along the lines of County Fair. Maybe in spring-y pastel colors even. But nope! The new edition turned out to be quite bold with a colorful candy theme, three different foil-stamped covers, and matching perforated pages. Perforated! I failed to see that clue in the stamp sheet (Mr. Three Staples did, for the record). 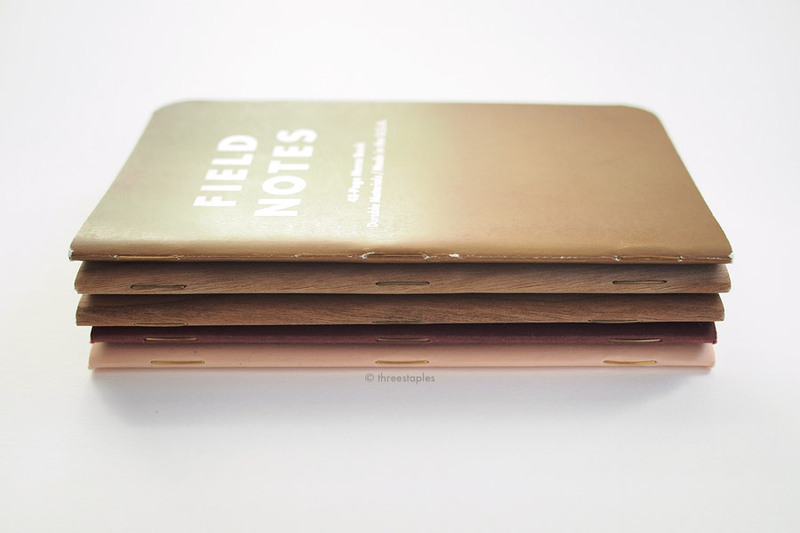 Well, my Field Notes Colors posts keep getting longer and longer, and this one is no exception. So, if you prefer, the TL;DR is right below. Keep scrolling for the long version. Scroll down even more for the minutiae of this edition. Sweet Tooth looks awesome but it's not a good fit for my daily writing need. Maybe for occasional use, since it's such a fun edition. Despite some misgivings, I renewed my subscription in order to get the amazing Commemorative Reprints. 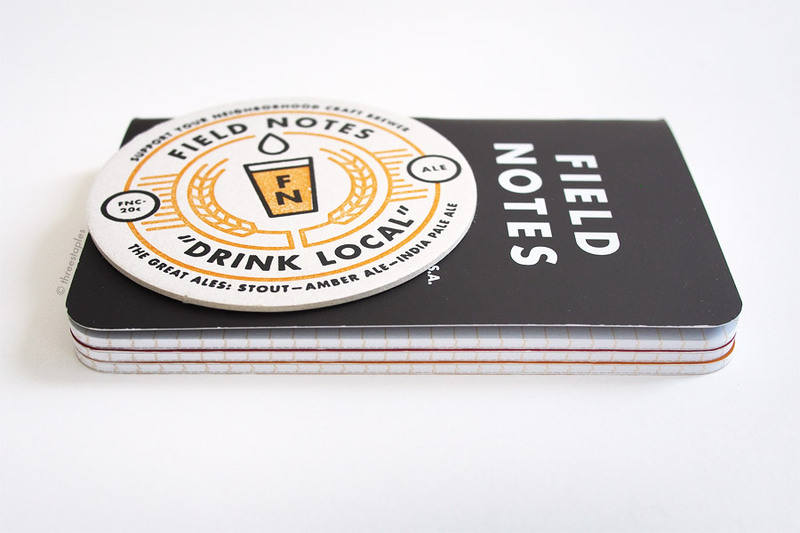 Field Notes still got me good. My initial reaction to Sweet Tooth was overall lukewarm. While I was excited about the delicious-looking foil-stamped French Paper covers, I wasn’t sure about the perforated pages. I am generally weary of perforation in notebooks because if not done well, it makes pages weaker at the spine and they eventually fall out from frequent use. 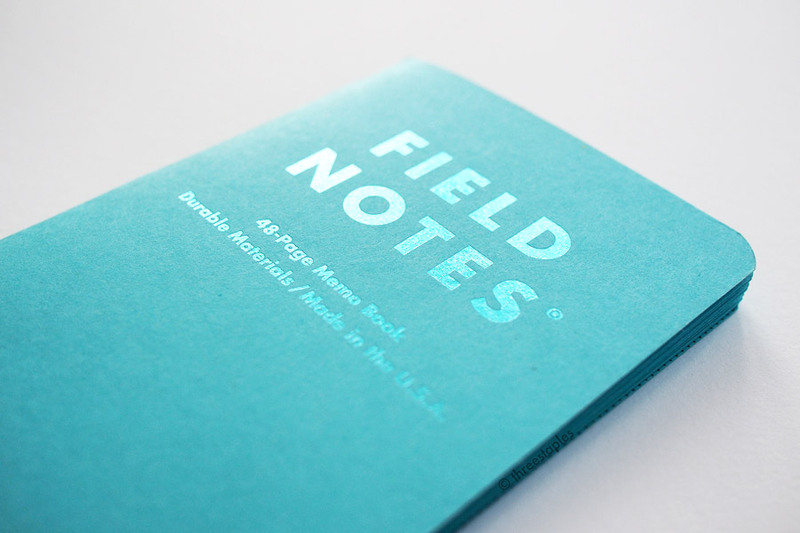 And Field Notes makes it pretty clear, in their product shots and video of Sweet Tooth, that the best use of this new edition is to tear out the pages as notes you can leave or exchange with other people. That is not how I use (and prefer to use) my Field Notes. 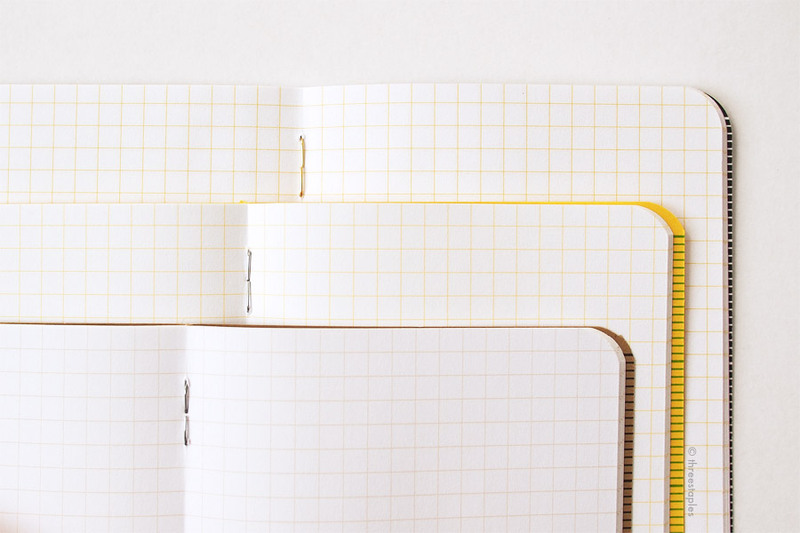 I use them for daily journaling, and naturally I want the pages to remain intact. Not to mention, I already have plenty of note pads and sticky notes that I'm in the habit of using (mostly at home) that fit Sweet Tooth's intended purpose. Maybe Field Notes version is better because of its portability but that portability is not an issue for me currently. 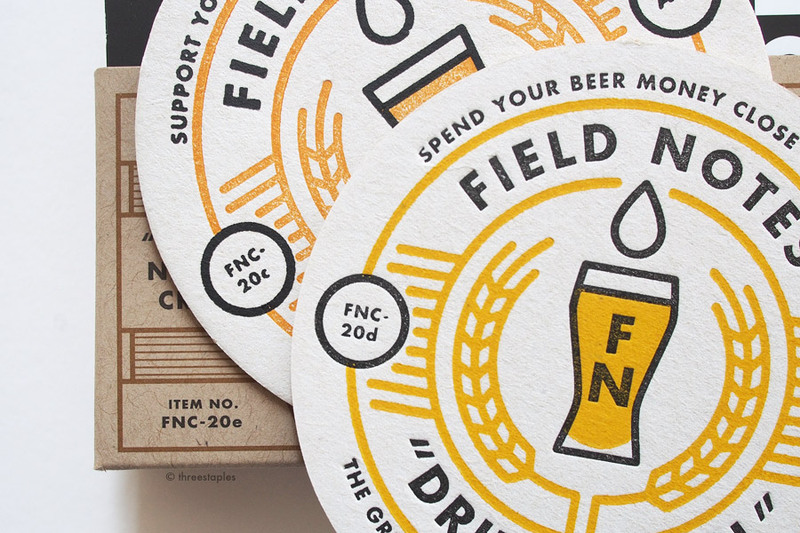 Perforation is actually pretty subtle, isn't it? Since I wasn't going to change my habits any time soon, I knew from the start Sweet Tooth wasn’t ideal for me. But I still tested it as a daily journal for about half a month, and I’m relieved to report none of the pages fell out on their own. 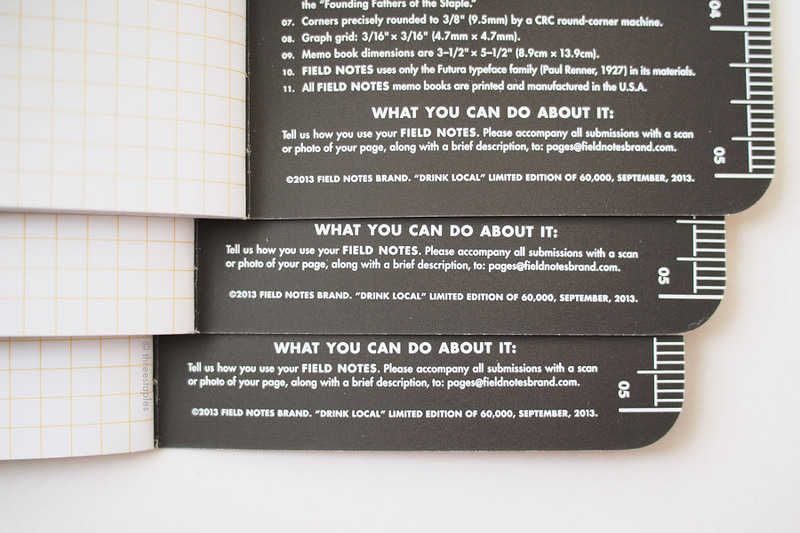 And like Field Notes claimed, I did not feel the perforation too much while writing in it. I’m sure the accurate placement of staples this time helped with that, but the paper did feel just sturdy enough that none of the pages folded on their own. Perhaps that’s why Field Notes chose the thicker 70#T for the body paper than the usual 50#T. But I’ll be honest, the fact that the perforation is there with the possibility of the page getting torn out still makes me nervous, even though it’s executed well. Pages tear off pretty cleanly. 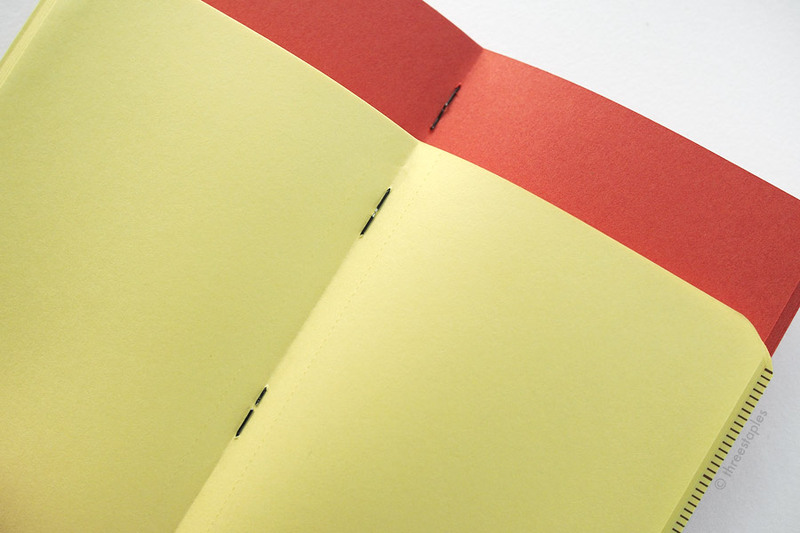 Speaking of body paper, I noticed many people voicing their concern about writing in colored paper, in this case red-orange, banana yellow, and sort of robin egg blue, that exactly match the covers. That I wasn’t too concerned about, since I actually like non-white innards. But once Sweet Tooth arrived, I realized the colors are bolder than I anticipated for my writing, and I had to rule out using the red one right away. Heck, even yellow felt too bright on my eyes, so I settled on using the blue book first. And it was just... okay. A little dark for my taste but I managed. My gel pens felt a little slicker on the paper (the same French Paper Pop-Tone as the cover), like it’s not as absorbent as the usual Finch Paper. I’m still on the fence about that. A brief test with my Pilot Kakuno F showed minimal feathering though, so that’s at least a good thing. If I were to use these on a regular basis, I would use a black pen or marker with a wide tip, like a Sharpie. Sharpie bleeds through just a little bit on the reverse. Inside covers are printed in dark brown ink. Visually, I really like Sweet Tooth. I love the texture variation provided by the metallic foil-stamping on matte French Paper covers (my favorite), and I really enjoy the dark brown ink on the inside covers, too. Not to mention the nice contrast provided by black staples. 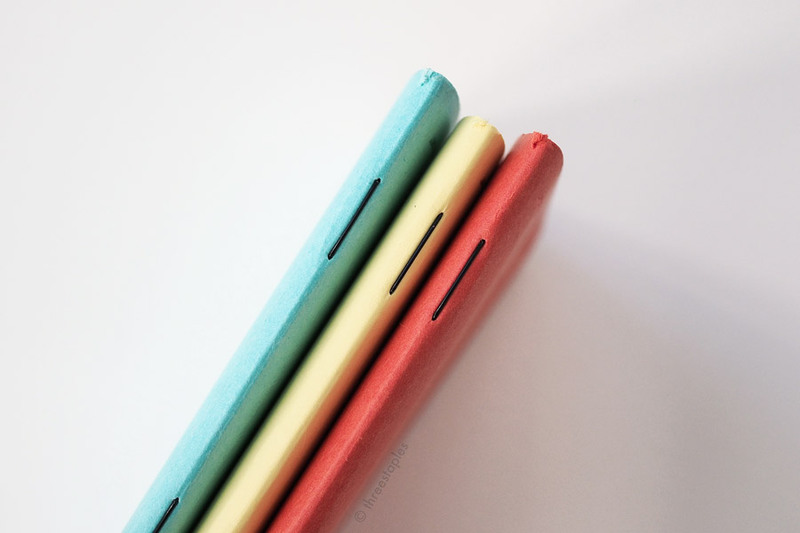 I confess, the candy theme is kinda lost on me but I’m still impressed by the “solid block of bright color” look they achieved by using matching innards. And the bright color choices make sense, since Sweet Tooth is meant to be used to leave notes. Notes that are meant to be noticed and read. Overall a unique and cheerful edition that reminded me once again that there’s never a dull moment in COLORS. But too many less-than-ideal features, like perforation, impractical body paper colors, and no ruling (my least favorite kind) make me place Sweet Tooth towards the bottom of my Field Notes ranking. It just doesn’t fit into my daily routine. But that’s okay; it wasn’t designed to, and I don't expect it to be a perfect fit every time. Good thing I have plenty of other Field Notes that I can use more comfortably and worry-free! 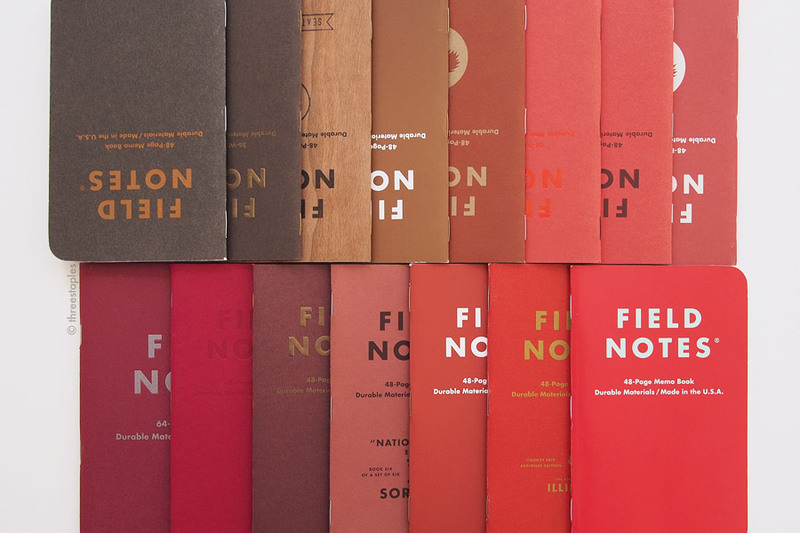 With Sweet Tooth, Field Notes accomplished two major “firsts” in their COLORS series, by perforating the innards and making the edition a “through and through” edition, where the color of the body paper matches the color of the cover. 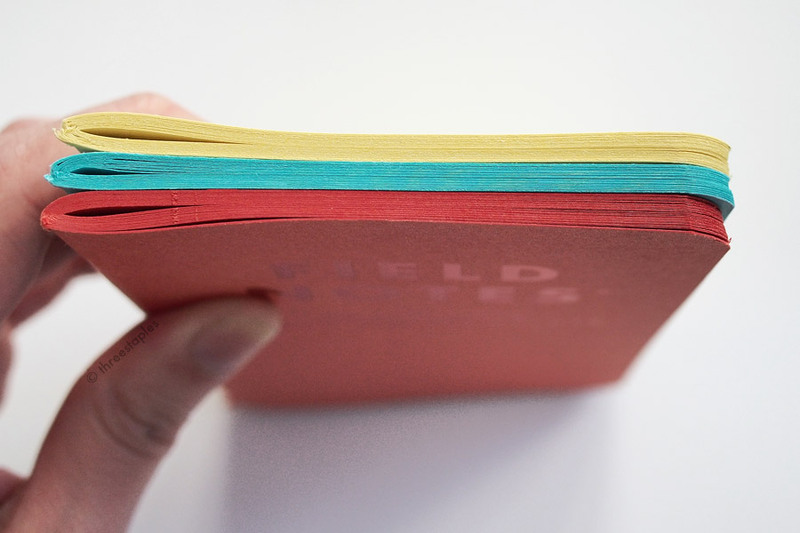 It’s not the first time Field Notes used colored innards; Northerly (Winter 2011), Traveling Salesman (Fall 2012), and Cold Horizon (Winter 2013) come to mind (excluding off-white innards here). But those colors were much more subdued than the ones inside Sweet Tooth. Plus, I believe it’s the first time French Pop-Tone is used as body paper. The other “first” is that the innards are left all blank in Sweet Tooth, as noted on its inside back cover. If I'm not mistaken, I think that's a first, too, that they point “a COLORS first” out and print it so on the back cover (meta! See image above). Or am I making this up? I suppose we've seen blank pages before in Arts & Sciences but it was only partially blank, where the back of each page was left unprinted. Sweet Tooth is the first COLORS edition where all pages are blank. As for the metallic foil-stamping, the last time we saw this printing technique in Colors was almost three years ago, in Night Sky (Summer 2013), and the first time was Balsam Fir (Winter 2010). I love foil-stamped covers, so I'm glad to see it again in Sweet Tooth, even though many of the recent non-Colors editions were also foil-stamped (e.g. Starbucks Reserve Roastery Edition and DDC Dead Prints). And the black staples? Sweet Tooth is not the first; Night Sky was. The random stack order of Sweet Tooth is not a Colors first either. Each pack of Unexposed was randomly packaged too but that was out of 6 possible colors, whereas you get all 3 colors in each pack of Sweet Tooth. Interestingly, out of 4 packs of Sweet Tooth I received, three of them had banana yellow book packaged on the front. Why does it matter? It doesn't. Sure, the Smarties in my Sweet Tooth mail was a nice touch (and long since gone) but in terms of bonus items, I think the Commemorative Reprints take the cake. In case you haven't heard, that's a special 2-pack consisting of reprints of the very first two Colors editions: Butcher Orange and Butcher Extra Blue. And every subscriber with an active year-long subscription that includes Sweet Tooth gets this bonus with a custom belly band printed with their name in a separate shipment. 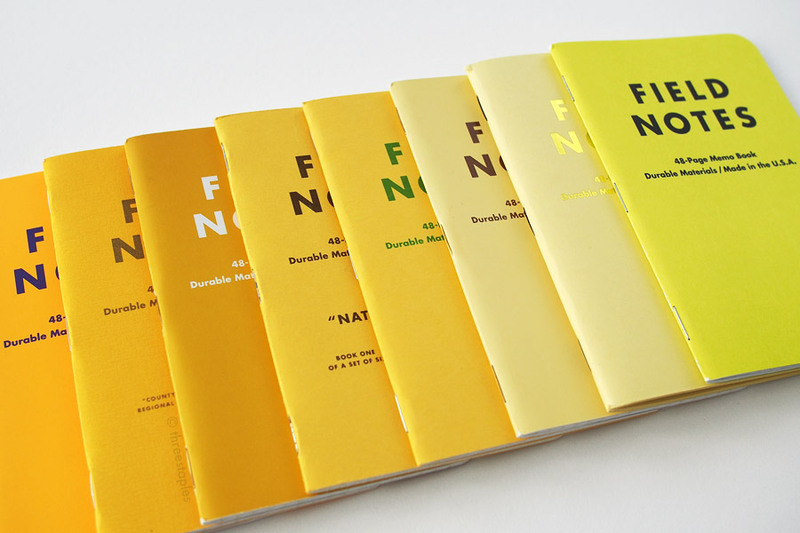 Thematically, these reprints have nothing to do with Sweet Tooth but they're Field Notes' way of celebrating the 30th quarterly edition (Sweet Tooth) and thanking their Colors subscribers. I'm super impressed by this gesture. I don’t want to get too much into it (a separate post coming soon-ish?) but the fact that they're reprints of possibly the rarest Field Notes and that each pack is customized, puts this season's bonus in a class of its own. How are they going to top this?!? If they ever do, I'm sure it'll be another complete surprise. As of this writing (late May), subscriptions starting with Sweet Tooth are still available, as are the individual 3-packs. By the way, the edition size of Sweet Tooth is 30,000 packs, which is more than the previous edition’s 25,000 packs (Snowblind), but still less than 40,000 packs two editions ago (Shenandoah). Does this matter? Maybe, maybe not! 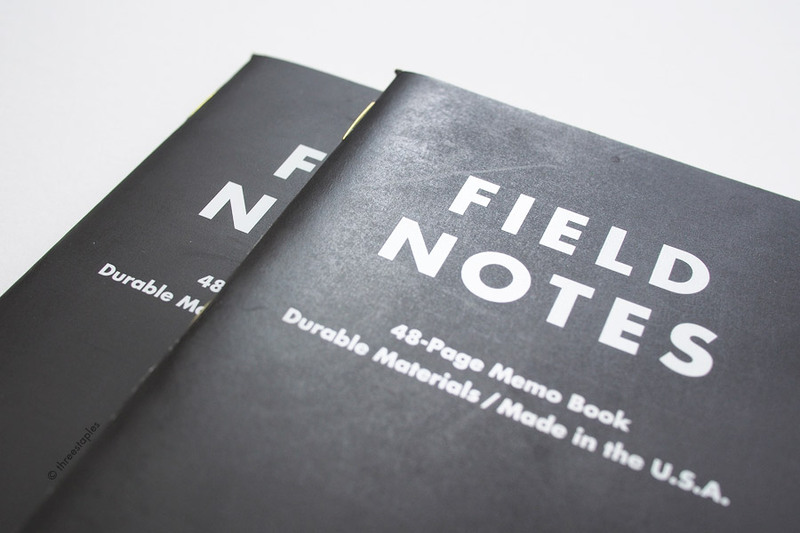 Field Notes have been making several changes recently, including shipping (which I noticed last year), checkout process, even email templates and website design. But the one associated with Sweet Tooth that I'd like to note is the subscription package. Most Field Notes orders used to come in brown envelopes but my latest order of Sweet Tooth (the first installment of my new subscription) arrived in a neat rectangular box printed with “Field Notes Quarterly Subscription” on the top. I prefer the box because it's a nicer presentation, and I noticed over the years that the little add-ons like Clic pens can leave dents on the memo books when the package is too stuffed. I've also seen buttons arrive in envelopes a bit crushed. I'll have to wait until the next installment to see if the box is only for the first quarter (where there are more extras), or for every quarter of the subscription. But for now, I approve this change! 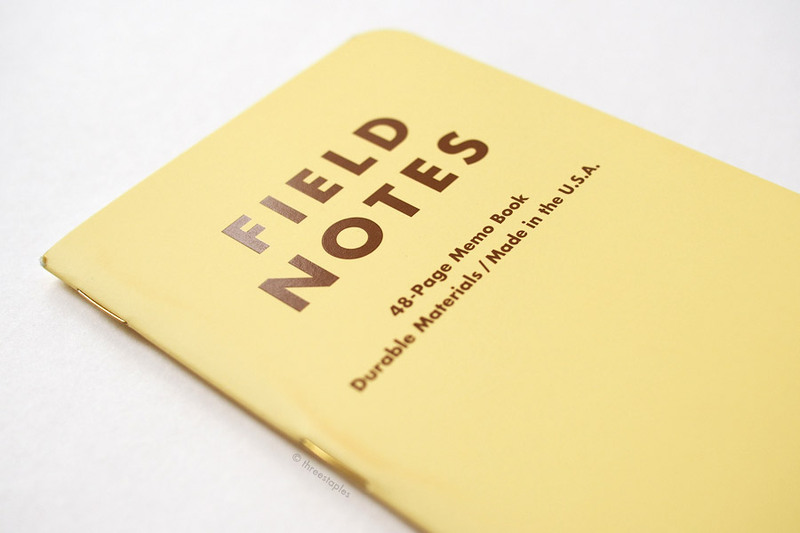 As a side note, with the recent website change and all, I feel like Field Notes is putting less emphasize on the term “COLORS” and more on “Quarterly Editions” now. I mean, do you see “COLORS Subscription” on the box? I haven't thought this through but that's the impression I got recently. That makes me a bit nervous because I don't want the new summer edition to be another Arts & Sciences (which in my opinion is a completely different product format, not simply a COLOR variation). Maybe I'm being a bit paranoid. Maybe it's an exciting shift. Maybe it's just me! I doubt the item numbering “FNC” will change any time soon but I guess we'll just have to wait and see how their marketing changes over time. Anyway, that was a long side note. Sweet Tooth is the 2016 spring edition of COLORS, the 30th in the series. 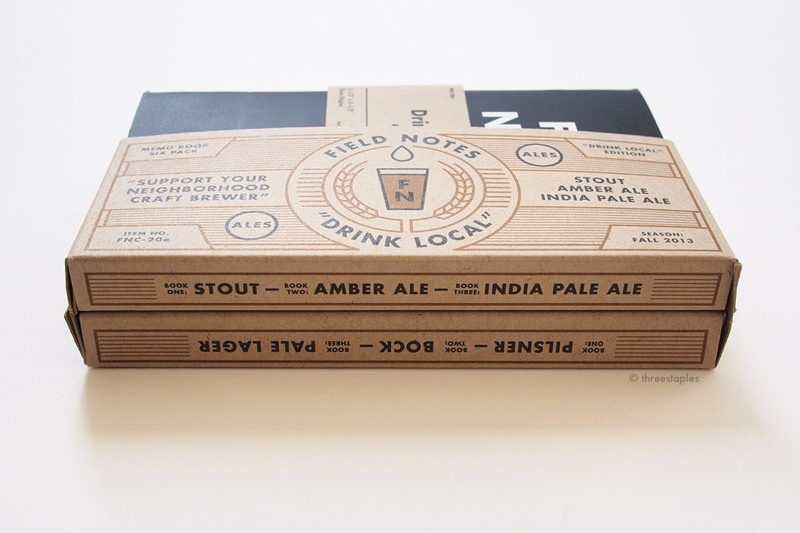 Edition size: 30,000 packs, March 2016. Covers: French Paper Pop-Tone 100#C in 3 colors: “Blu Raspberry,” “Banana Split,” and “Tangy Orange,” stamped with matching Crown Roll Leaf, Inc. series BW88 metallic foils, by Nu Wave Die Cutting & Finishing, Chicago, Ill.
Blank pages inside but perforated on press with the CITO RSP In-Line Finishing System. Quick red comparison (from left): Fire Spotter, Starbucks Coffee Origins, TED, County Fair, Drink Local “Amber Ale”, Sweet Tooth, Tournament of Books 2015, National Crop “Sorghum”. Not pictured is the red orange book from Mackinaw Autumn, which also uses the same French Pop-Tone “Tangy Orange” in Sweet Tooth. Hey, it looks eerily similar to French Pop-Tone “Sour Apple” used in National Crop's “Soybeans”. What are your thoughts on Sweet Tooth? Do you use it regularly? I hope I didn’t come off too negative. I still think it can be used effectively, especially for drawing or exchanging/leaving notes on the go, if you do that a lot. And as a fun gift! I definitely plan on gifting some Sweet Tooth to my young niece and nephew (and thus justifying subscribing with Sweet Tooth to get the Commemorative Reprints). Maybe I’ll start carrying one in my bag for random notes and see how it goes, too. 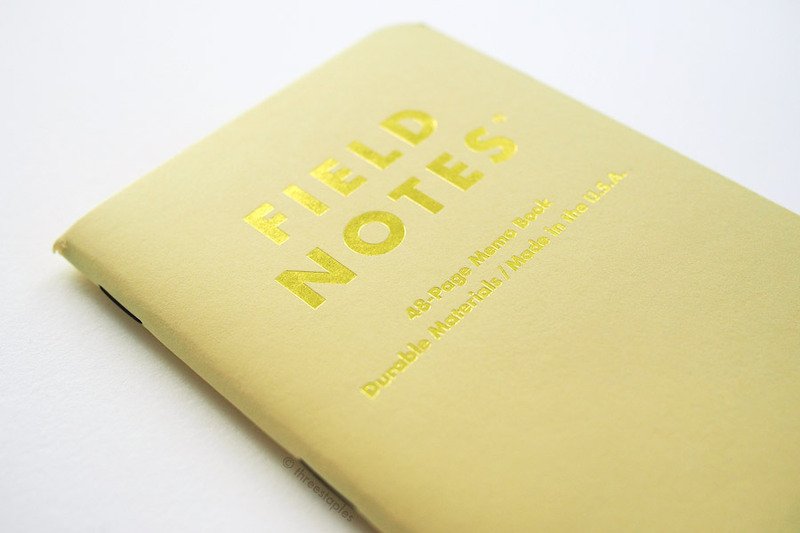 I wonder if Field Notes will ever make an edition with sticky notes...?